It’s going to be fairly easy to determine the success or failure of the move because the standings will tell us. If the Redskins make the playoffs and the Eagles don’t, it’s a big swing-and-miss for Reid and revenge for McNabb. If the Eagles make the postseason with Kevin Kolb and the Redskins don’t with McNabb, Reid gets the check mark and a sense of satisfaction. Yes, this trade, which affects the short and long-term futures of two franchise quarterbacks, two well-regarded coaches, and two rival franchises is incredibly simple. If the Redskins make the playoffs, they win. If the Eagles make it, they win. So easy. It’s not like there could be many years of ramifications based on the play of each quarterback. And of course the two high draft picks the Eagles received in the trade don’t factor into any long-term equation. Everyone’s going to be closely watching the Eagles and Redskins this year, and this probably won’t be the first time a writer makes this case. In fact, I would bet good money that if Mike Shanahan and Donovan come into town the first week of October and win, local and national guys alike will go crazy for that story. 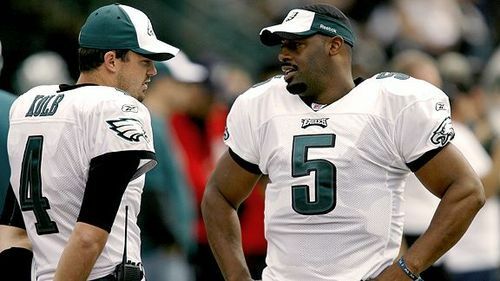 It could in fact begin even earlier than that, if Kolb starts out slow or McNabb looks great from the start. Enough. There’s plenty to discuss and debate about this deal for years to come. No reason to rush to judgement, even after a full season. Let’s just wait and see. Tagged with Donovan McNabb, Trade, Andy Reid, Philadelphia Eagles, Washington Redskins, Mike Shanahan, Kevin Kolb, 2010, Don Banks, Sports Illustrated, Franchises, Long Term. July 16, 2010 by Brian Solomon.